Today’s post was written by Eran Megiddo, vice president of Education Engineering at Microsoft. As part of today’s Microsoft’s Education announcement, we are announcing new and unique experiences and updates to Office 365 Education coming summer 2016* that will make it easier for teachers to manage their classroom; students to learn; and IT administrators to set it all up. Office 365 Education now includes Microsoft Classroom, a single experience for managing all classes and assignment workflow—with a teacher and student view. Microsoft Classroom has a OneNote Class Notebook built into every class, allowing teachers to create assignments with due dates, complete with Outlook calendar events and reminders. The assignments can reference materials from the Class Notebook, Office documents and interactive content. You can create assignments for multiple classes at the same time, easily grade them, or give them private feedback and ask them to resubmit. Students can receive, complete and submit assignments on their favorite devices, including mobile devices via the Microsoft Classroom app. Throughout the workflow, they have the ability collaborate with classmates in real time within Office documents, online or offline, without worrying about losing formatting. 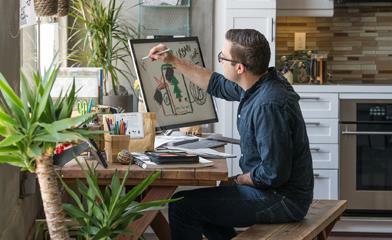 “OneNote Class Notebooks have redefined the instruction at my school. 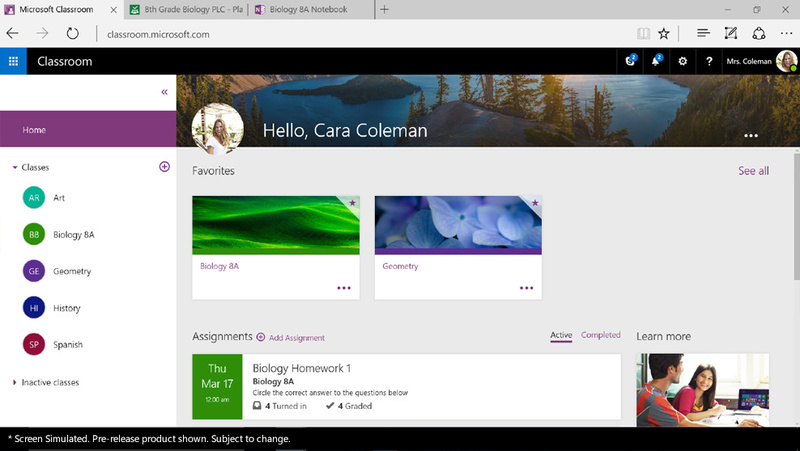 Now, with the new Class Notebook add-in announced last month, built based on teacher feedback, teachers can share, track and grade assignments across classes wherever is most convenient (OneNote, Microsoft Classroom or their existing LMS)—without having to jump between websites and applications. Any teacher can start a Class Notebook for free by going to onenote.com/classnotebook. Learn more about today’s announcements and get started by going to the blog post here. Today, we are also announcing Microsoft Forms. 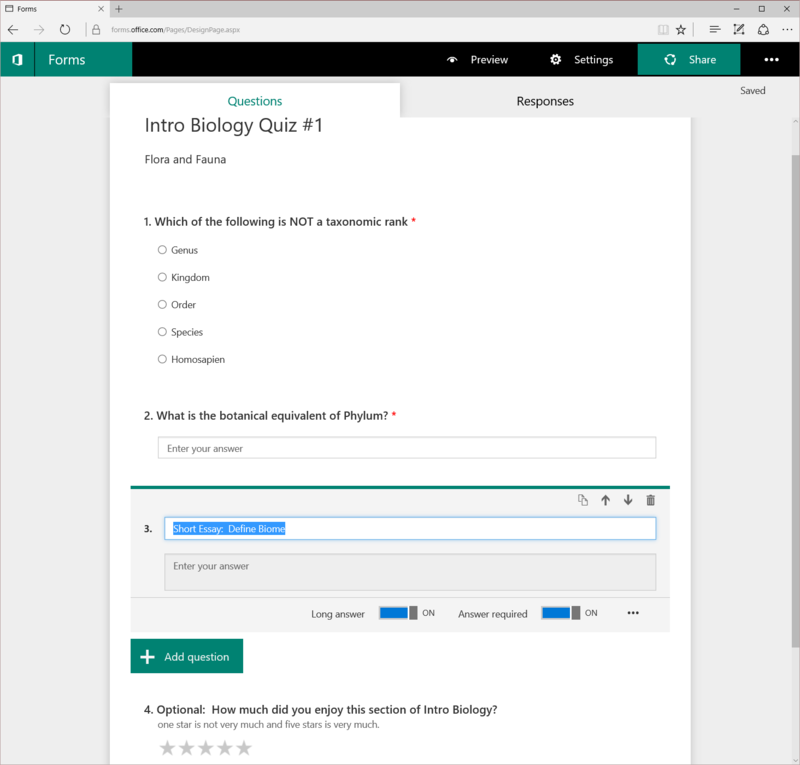 Microsoft Forms is a new part of Office 365 Education that allows teachers or students to easily and quickly create custom surveys, quizzes, questionnaires, registrations and more. Form authors can invite others to complete forms, which they can do using any web browser, even on mobile devices. Form authors can view results as they are submitted using the built-in analytics, and Forms data (i.e., quiz results) can be easily exported to Excel for additional analysis or grading. We have heard that administrators want the flexibility to set up and manage their online classroom. That’s why today we are announcing School Data Sync (SDS), which will also be included in Office 365 Education, to enable the class creation and updates in Microsoft Classroom. By syncing user profiles and class rosters from a Student Information System (SIS) into Office 365 Education through Azure Active Directory, SDS automates management of classes and class materials for teachers, freeing up time for lesson planning and teaching. Students logged in to Office 365 Education are automatically logged in to other supported classroom applications—saving instruction and administrative time. Since IT admins can determine what student data to sync and which apps can access the data, it is easy to remain in compliance with your standards and policies. We have a list of the SIS partners on the School Data Sync website here and will continue to add more throughout the preview. A primary goal of ours is to deliver value to educators by delivering assignments (and grades) created in Office or OneNote in other education applications. Already, for launch, we have over 25 education partners committed to integrating with Office 365 Education. Read more about Omaha Public Schools’ journey with Office 365 Education here. Just as teachers have been using Class Notebooks in their classrooms, they have also been using a similar digital notebook with their fellow staff members. OneNote Staff Notebooks help them save time, get organized, collaborate more effectively and capture activities, such as professional development and classroom observations. Earlier this week, we announced that school leaders, teachers and education staff who do not have an Office 365 Education account can sign up for free and create OneNote Staff Notebooks for their schools. In a few simple steps, education staff leaders can add staff members into their Staff Notebook; set up a collaboration space for meeting notes, shared curriculum or initiatives; create a Content Library for read-only staff material; and add a private workspace for each staff member. Within Office 365 Education and Microsoft Classroom, just like in a Class Group, educators have a “teachers’ lounge” in Professional Learning Community (PLC) Groups, which gives them one place to track tasks, share files and connect to conversations in or outside the school. A PLC is a group of educators who meet regularly to share expertise and work collaboratively to improve teaching skills and the academic performance of students. Today, Office 365 Groups allow educators to foster collaboration for staff and professional development; enable streamlined communication among technology teams and departments; organize training and classes and much more. We are in the process of customizing Office 365 Groups to fit this PLC model even more easily in the future. We could not be more excited about the path we’re on and what we’re delivering for teachers and students this next school year. We want every student and teacher to reach their full potential as a result of using our products. Central to this commitment is helping teachers adapt content to meet the needs of each of their students, including students with learning differences. Today, Learning Tools for OneNote complies with accessibility requirements out of the box and helps students improve reading and writing skills. We will have updates coming very soon for Learning Tools, including the impact on students we have seen in a relatively short time this school year. To continue to deliver on that, we openly ask for your feedback via our UserVoice site. Additionally, we have added a new Education filter (under “Services” in “Filters”) on our public Office 365 Roadmap, so you will soon see new features based on your feedback reflected in our products. Stay tuned for more exciting updates coming over the summer.